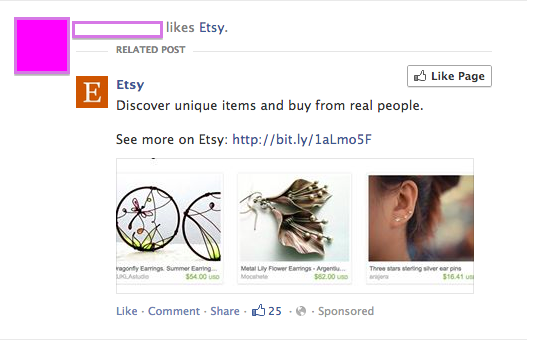 I’m always interested in the conniving ways that brands get you to “Like” their page on Facebook. Like us and win! 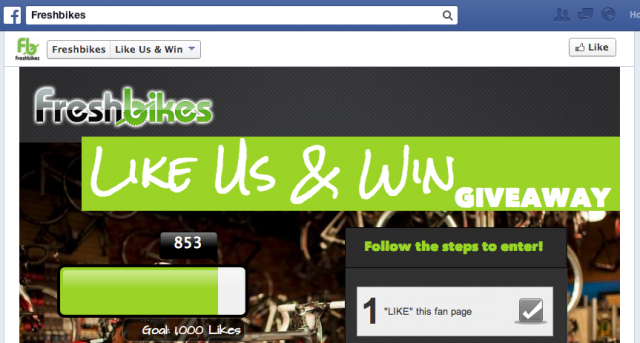 Like us for free ice cream! It seems like marketers are willing to give away just about anything to watch that Like count climb. And for a while it was of little consequence how many pages we Liked, until Facebook introduced the dreaded sponsored stories. If you are not familiar, sponsored stories are those posts that show up in a user’s newsfeed informing them that one of their friends has decided to engage with a brand on Facebook. The friend has either liked a page or responded to a poll or commented on a photo. The sponsored story gives the brand who bought it a direct audience with people who have not liked their page, and it does so right in the newsfeed where users are actually looking. But everyone that has ever hovered over the arrow to stop getting updates from Engagement Rings Unlimited can rejoice, because Sponsored Stories are going away. It should come as no surprise that Facebook is making changes, since they social media behemoth is famous for constantly tweaking, updating, and generally moving around features of their site, both on the user side and on the marketing side. But what does this change mean for Facebook marketers and why are they doing it? The daunting truth is that Facebook currently offers 26 different advertising products, including sponsored stories. And the team at Facebook has figured out that it is really too much to ask for marketers to craft a perfectly balanced strategy with so many different options on the table. That’s why Facebook is not only eliminating their sponsored story product, but are also going to cull half of their advertising products, which will really serve to narrow things down. According to Facebook, the company wants to focus on finding solutions for marketers rather than selling a la carte products like sponsored stories, many of which end up being redundant in their ultimate impact. This means creating marketing plans that can help marketers reach their goals, whether that’s more likes, more contest entries, or more web traffic. But it isn’t like the idea of sponsored posts is going away. In fact, that’s exactly what Facebook representative Brian Boland told Ad Age earlier this month: “sponsored stories as an idea doesn’t go away. Sponsored stories as a product goes away.” After all, one of the most unique offerings that Facebook has is its ability to mine the social graph and find marketers the best possible fans and eyes for their ads. The new Facebook advertising platform will still utilize social data and targeting, but not in the form of sponsored stories. From a users perspective, not having these kinds of “native ads” show up in our newsfeed feels like a win. From a marketer’s perspective, Facebook’s product consolidation will still need to be seen before we can make any real judgments. If you want to read about the change in Facebook’s own words, you can do so on their blog.